Effectively building culture often means delving into some unusual territories. Case Study: The Bunnings Board Game. When traditional training methods weren’t enough, we developed a ‘Selling Skills’ board game for Bunnings to encourage team members to interact with each other and have fun, whilst also increasing their knowledge and skill base. The game built on an earlier ‘Selling Skills’ video, and was accompanied by a poster campaign and a video trailer (which you can see to the right). The game won an AHRI Award for Innovation in Communications, proving that thinking outside the box can most definitely be worth it. Case Study: The Officeworks Storybook. In order to help cement the culture of Officeworks, we developed a multiplatform project detailing the Officeworks journey, and used as part of the induction process for new team members. 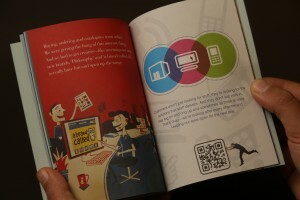 Produced as a beautifully-designed book, it contained QR codes that, when scanned with a smartphone, would lead to short, specially developed videos that further told the story of Officeworks. The booklet also existed as an e-book on the Officeworks intranet, and was an engaging and completely innovative way of both inducting new team members, and strengthening the culture of the existing team.